Like probably most people, I think I look better with my tan on. I’m not sure if it’s the shadows of the building or what, but it just seems like it’s much harder for me to stay tan living in New York City as compared to when I lived in Texas. So in order to maintain the tan I got from my Puerto Rico vacation, I’ve been making it a mission to play in the sun on weekends (with proper SPF protection, of course). If you’re a skin doctor, you’re probably cringing at that statement. But I just can’t help myself — my clothes looks so much better on darker skin. Outfit Combo: pleated crepe shorts from J Crew, tank from Pins and Needles, mccaren tote from Madewell, estelle leather flat sandals from Pour La Victoire, . I simply LOVE these colors mixed together!! they get me happy for summer! Such a great outfit and I just love how well your hat matches your shorts. That blouse is beautiful! Oh wow, the minty green and red look amazing together! And I love the lace details on the top. Such nice colors combo, very perfect! I’m with you. Everything looks better with a tan! Such a pretty Summer look, I adore these sandals. Yes having a tan is nice, but so bad for your skin. Funny but I just bought self tanner today from Kiehl’s I hope it is good. Love this look! Lovely summer look, great color combo!!! These colors are two of my FAVORITES right now, and I love them together! I’ve pretty much given up on trying to be tan… I try to embrace my paleness. 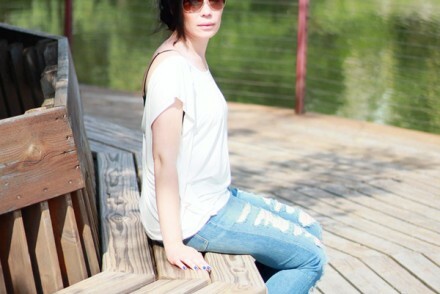 Although every summer I hold out a little bit of hope that I’ll get a teeny tiny bit of color (that’s not pink) maybe! Very cute, love the orange shorts. That’s so interesting! Being asian, I actually think my skin looks better when it’s whiter, as opposed to being tan. I feel like I have more of a glow with lighter skin. I also feel like tanning makes my skin blotchy & patchy. It does suit you though. Love the bright outfit btw, goes perfectly with your tan! I always feel better with a tan, but I am way pale. You look beautiful in these colors. You look too cute! Loving that crochet top! 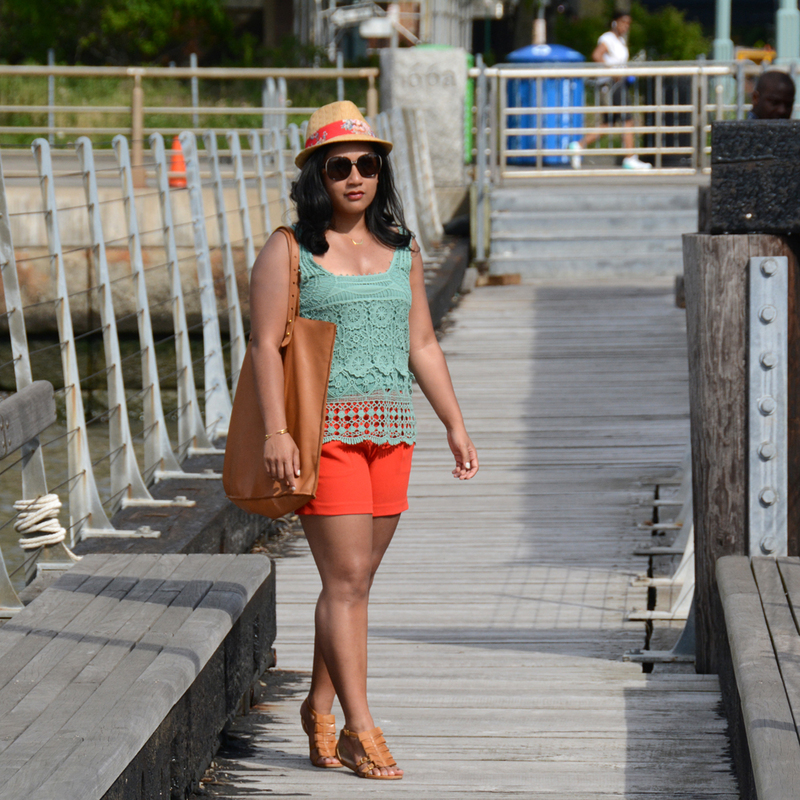 This summer I love bold patterned or colored shorts! These are great! perfect summer style! love the top! I always think I look healthier with a tan. I love this color combo! Super cute outfit! I love the vibrant color combination! Great summer outfit. The top is very nice. Lovely! The color combo is GORGEOUS! You look fantastic!!! I love the shorts! 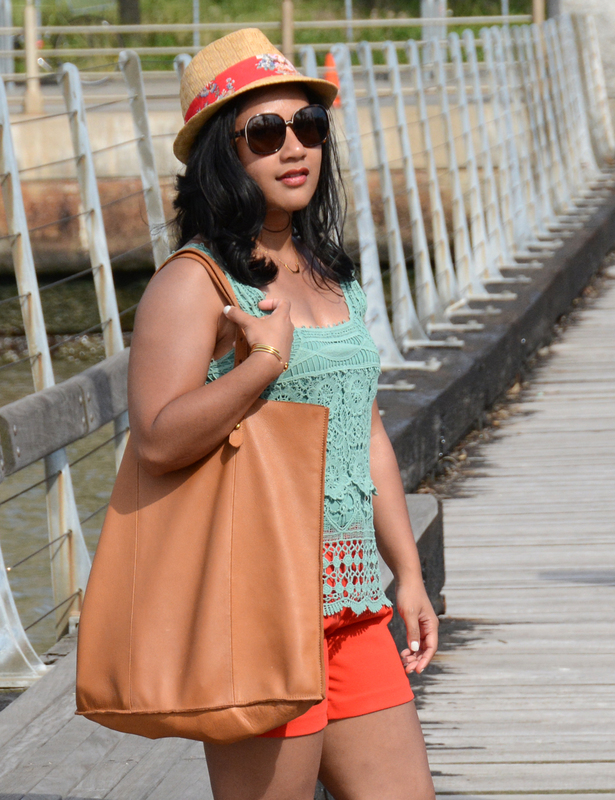 Love the tote and the flats! I think it’s glorious that you love your tanned skin. You do you! I love the turquoise chrochet top combo with the orange/coral shorts!! Its the perfect summer outfit!! I get tanned pretty quick and its one of those dark tans that makes me look rather weird, so I am the kind, that lathers up SPF and stays in the shade in summer :). Have a great week ahead! Cute look! Perfect for that heat that’s about to come. Now that the rain seems to have subsided, Texas is expected to get HOT! It’s probably a NYC thing. People here aren’t as consumed with tans as in other places. If you were in New Jersey or maybe Long Island… you’d look like Tan Mom. Lol. As you’ve probably picked up on, we work long long hours and do a lot of cultural events which are mainly indoors. Also, people here where SPF all year round to protect their skin, at least my friends do. You’ll get used to not having a deep rich tan and grow to appreciate it. Not sure if you go to the gym but if you do, maybe you could move your workout to outdoors. That might be one way of taking in some rays. Whatever the case, cute combo and loving the color of the shorts.